Occasionally, life can weave together a professional and personal story in a way that is so fantastic as to seem fated rather than coincidental. 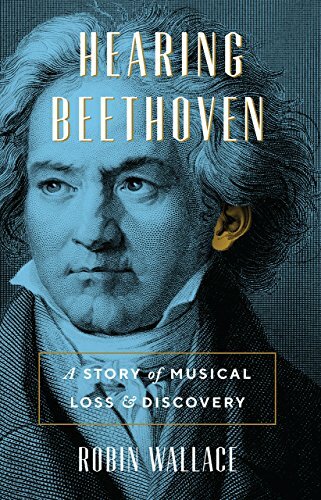 Robin Wallace’s book, Hearing Beethoven, is not just the story of a composer who lost his hearing. It’s also the story of the Beethoven scholar, Wallace, whose wife suddenly lost her hearing at the age of 47. She’s referring to becoming deaf late in life. Capital “D” Deafness differs fundamentally. Deaf children born to either Deaf parents or enlightened hearing ones will learn a manual language¾in this country, American Sign Language¾and therefore have a community with which to socialize in their mutual language. Barbara’s husband, her children, her family members and friends were all part of the hearing world. In telling Barbara’s story Wallace also shows us how Beethoven’s hearing loss contributed to his becoming socially isolated. It’s tempting to quickly imagine ways around this isolation. Instead, Wallace shows us how difficult it is to write notes quickly enough to transmit thoughts, write while driving, or write while conversing with a group. A performing artist losing his hearing would certainly have lost his career as well. Even though Beethoven’s feedback loop was closed—composers are certainly influenced by and collaborate with performers of their music—he had the advantage of being a creative artist. Wallace thoroughly researched the ways in which he learned to adapt to his growing disability: from cardboard resonators to amplify the sound of the piano to a growing reliance on the way the music looked on the page. Similarly, Wallace and his wife learned to adapt. When she had lost a large portion of her hearing they relied on a “pocket talker” for amplifying conversational sound. When she lost all her hearing they turned to Cochlear implants. If pitch (the rate of vibrations) and timbre (the character or quality of sound) are problematic, what’s left is the durational aspect of music¾rhythm. This understanding leads to a final connection Wallace makes between Beethoven’s decreasing ability to hear and his compositions. Rhythm is the aspect of music one can feel bodily¾everything from the duple feel of walking to the triplet feeling of skipping or dancing a waltz. However, it’s not just that rhythm is the embodiment of sound; rhythm is the most identifiable aspect of music to someone who is losing his hearing. Many of Beethoven’s later compositions have powerful rhythmic components¾the second movement of Beethoven’s “Seventh Symphony” is built upon a simple two measure rhythmic phrase. And, arguably, the most iconic, enduring motif in Western music is the opening four notes of Beethoven’s “Fifth Symphony.” It’s a motif so wedded to its simple rhythm that it’s possible to describe it entirely in durational terms: short-short-short-long. Robin Wallace’s book not only humanizes one of the most famous composers in the history of Western music, it serves as a beautifully written love letter to his late wife, Barbara.